Beginners are sometimes puzzled as to whether a router should be pushed or pulled. As long as the router is going in its intended direction the answer is ‘either’. It’s sometimes more convenient to pull the router, e.g. when rebating, where some users reckon they get better control and better visibility. 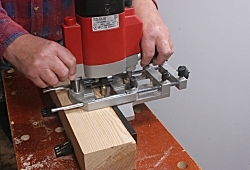 It’s worth practising both directions, so that you can use whichever is best suited to the particular cut.